This update adds publishing of battle challenges to the Steam Workshop and some new tools for fleet editing. However, much of the work since last update has been in background functionality to support persistent fleets and other functionality needed for new game modes. 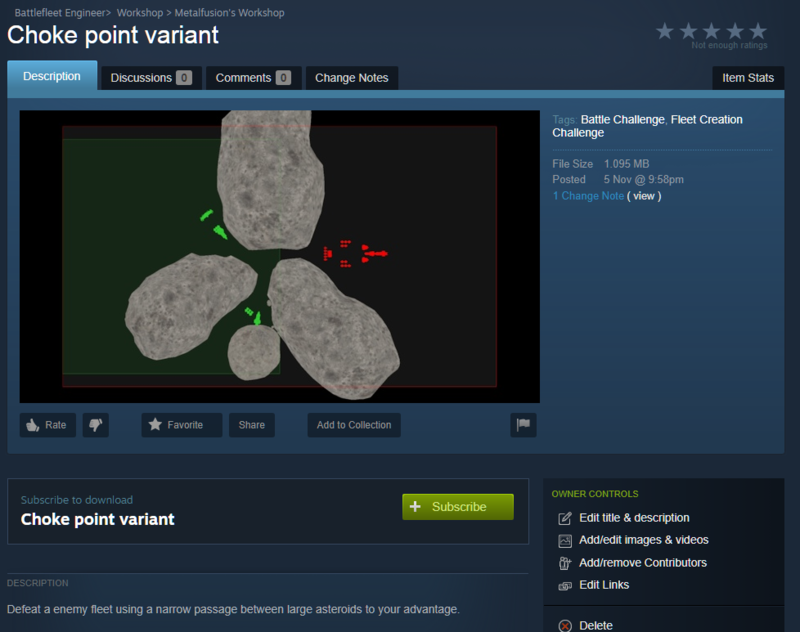 You can now publish your own battle challenges made in the Battle editor to the Steam Workshop and download ones made by others. The challenges can include your own ship designs for both the enemy and player fleet. Highscores are still only local for now at least. Can now subscribe to battle challenges from the workshop using the Steam client or Steam Workshop website. Can now publish your own battle challenges to the workhop from the battle challenges screen in-game. Battle challenges screen now shows a preview image of the level including level bounds, asteroids, ships and deployment areas. Implemented tracking, visual comparison and reverting of changes made to the fleet in the editor. These will be more useful with persistent fleets that will be repaired and rebuilt incrementally between battles. Stores each ship's state before editing, desired state before editing, and edited state. Can display the fleet in any of the stored states. Can compare any of the stored states with a visual overlay that shows changed, removed and added modules. Replaced ship rebuild command with a more featured revert command that can revert to any stored state and shows a live preview. Can now display damage and engagement range overlays in the fleet editor. Toggle using shortcuts: left Ctrl + F1, left Ctrl + F3. Now tracks how many of each module type has been added and removed in the ship. Can display a comparison overlay between ship state before and after current edits. Added shortcut: double click on a module to select all modules of the same type. Replaced all battle background music. Old battle background music added to the menu music playlist. Refactored handling of ship active core switch and splitting so that the ship origin no longer changes. This should help with some glitches and improve performance of those operations somewhat. Ship blueprints loaded from battle challenges are no longer shown in the ship blueprint browser. 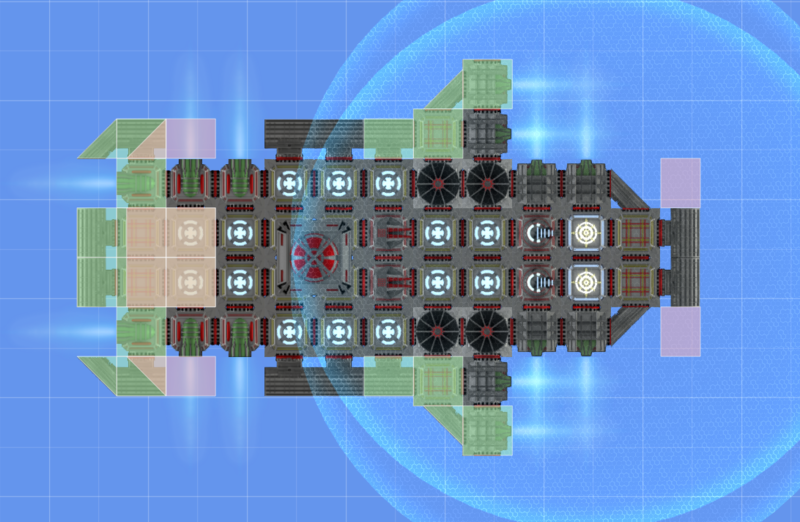 Ship blueprint browser now retains selection when updated. Made radio button labels clickable in the publish to workshop dialog. Can now scroll through the challenges using the up and down arrow keys. Battle challenges now have separate title and description. Resizable columns in the battle challenges listing.